Dennis will again be exhibiting at BTME 2015 on stand A5 where turf professionals will be able to see a range of products from the innovative British manufacturer. The Dennis and SISIS bowling green maintenance seminars finished in style for the year at BP Llandarcy Bowls Club in South Wales; with demand for tickets resulting in an extra day’s seminar being required to cater for the overwhelming number of greenkeepers wanting to attend. 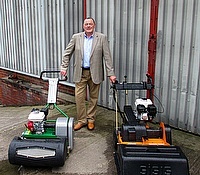 Here Mel Evans MBE and Lynn Pritchatt talk to us about their relationship with British manufacturer Dennis mowers. Here Mel Evans MBE and greenkeeper Mark Audin talk about their involvement with Dennis Mowers at the Waterloo Bowling Green. Tottenham Hotspur Football Club grounds manager Darren Baldwin considers Dennis as a key supplier of maintenance equipment for use at both White Hart Lane stadium and the club's new state-of-the-art training complex in Enfield. 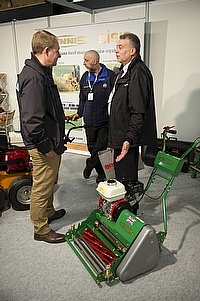 A visit to the Dennis stand on B40 at IOG SALTEX 2014 will show how the company's range of world class turf maintenance equipment enables turf professionals to benefit from cutting edge technology. Due to the continued success of the Dennis brand, the company is pleased to announce the appointment of Stephanie Ambler as export sales administrator. 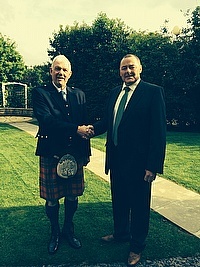 The newly created role also signals the company's rapid growth in the export market. 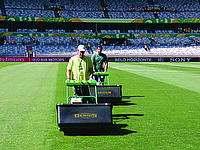 Leading British manufacturer Dennis Mowers has won a prestigious order to supply over thirty G860 34â€ professional cylinder mowers, complete with a range of interchangeable cassettes, to help prepare all twelve stadia at the forthcoming 2014 FIFA World Cup in Brazil. Alistair Hollis from Bowls England tells us why the organisation attends the Dennis & SISIS bowls seminars. Barclays Premier League side Crystal Palace has become the latest top flight club to purchase a Dennis G860 mower complete with a range of interchangeable cassettes for use at their Selhurst Park stadium.